Take a seat and let us show you the redesign of a home with side-by-side comparisons of each room as it was before and after. Much more than a simple paint job, the interior designer Michael Degois has completely transformed the apartment: all existing partitions were demolished so as to give the space an open, spacious feel, and each room now displays strong elements of artistry, light, and modern decor. Before: All of the before versions of this home display dark tones and soft, fuzzy textures. Fully carpeted in grey, divided by partition walls, and covered in dated wood panels and wallpaper, this before apartment was fully living in the 1970s. After: The living room has been minimally treated, with strong emphasis on the light and views of Chaumont outside the large window. 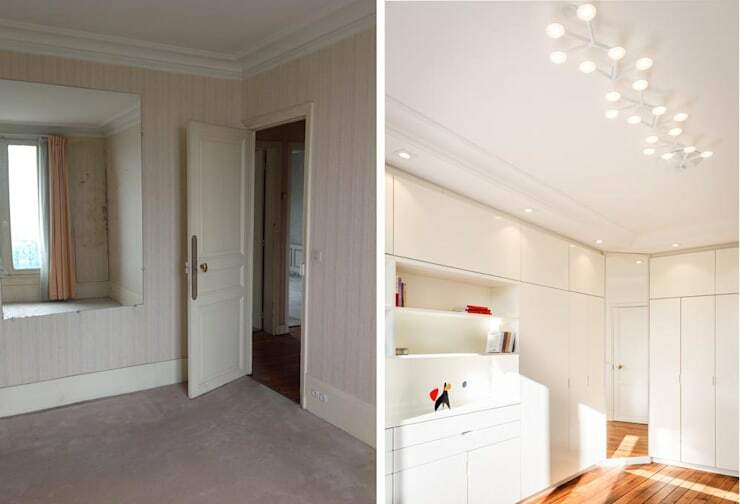 Inside, brilliant white covers the walls and ceiling, while the floor reveals a light wooden floor that had been hiding underneath the grey carpet. 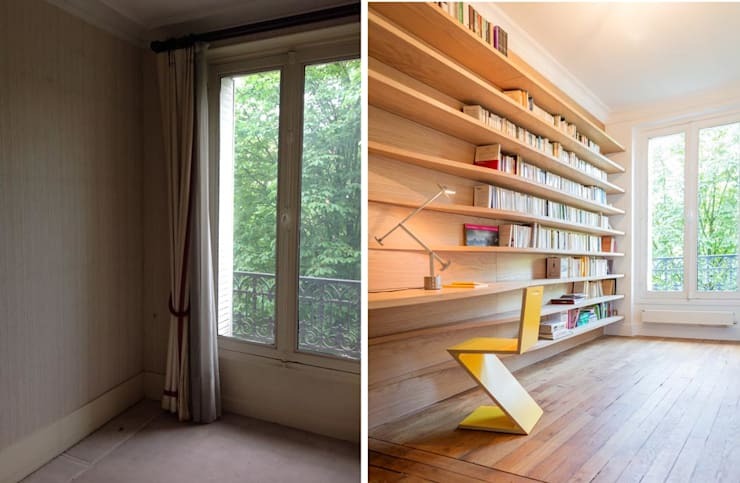 A custom-built bookshelf contains artifacts and books in a playful, angled design, also housing a bio-ethanol fireplace and two sliding mirrors that cover the T.V. when not in use. The dining room has been given an equally brilliant coat of white paint, with a similar hanging lamp adding a cohesive modern theme to the home's lighting fixtures. As you'll see throughout the tour, the fine lines, mixture of angles, and emphasis on clean, geometric shapes dominate the home's decor scheme, making for a look that's dynamic and modern wherever you turn. One notable aspect of this reno job is the way the interior designer has preserved the original paneling on the walls, modifying it by painting it in a monotone white paint. Sometimes, all it takes is a coat of paint to bring an outdated style back in the game. The kitchen retains most of its shape and arrangement from the previous version, but all of the surfaces have been updated to include more streamlined textures and dynamic patterns. With a new black and white theme with polished surfaces, the kitchen reflects much more light, turning a small, drab cooking space into a small, stylish one. 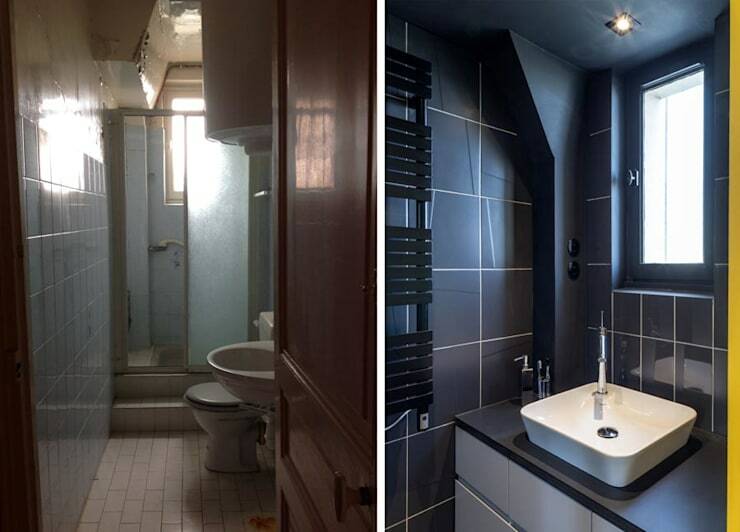 Undergoing the most drastic change, the bathroom has gone from a dank, shady corner to a dramatically dark bathroom space, placing a high emphasis on rich, smooth surfaces. Where the shower stall once stood, there's now a stylish square sink to accompany the square black tile and rectangular towel heater. The office of the home has also gotten a stylish update, but the designers have opted for a more lighthearted look in this room. The wall in this image incorporates corrugated shelves that vary in depth according to their function – where a desk has formed, the shelf is wider, and where the chair sits close to the wall, the shelf fades away. With the repetition of parallel lines, this office establishes an ordered, even appearance – perfect for someone who likes to work without visual distractions. The bedroom once offers very strange plank walls in a dim colour that appears to be somewhere between pink, brown, and grey – while it may seem like a calming neutral choice, this muddy colour was really getting the place down. Likewise, the mirror's heart is in the right place, attempting to bring light and nature into the room, but its frameless arrangement lacks context, making its placement seem thoughtless and rash. In the new bedroom, the walls are absolutely filled with streamlined storage, turning the entire place into one large closet that keeps clutter out of the way. A new mirror is nestled on an angle in the corner, with its own bit of wall that offers distinction and context. Simple and ordered, this new bedroom benefits from the convenience of extra storage, as well as from the light, neutral colour that gives the room a clean and rejuvenating air. Looking for more chic apartment reno? 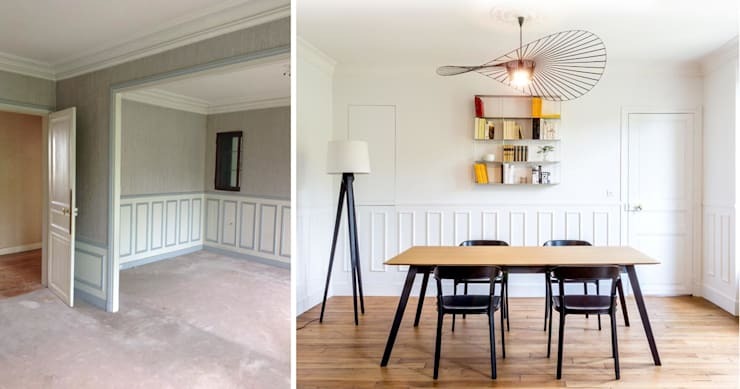 Visit this ideabook to see how these interior designers transform an old-school office into a stylish short term rental apartment! 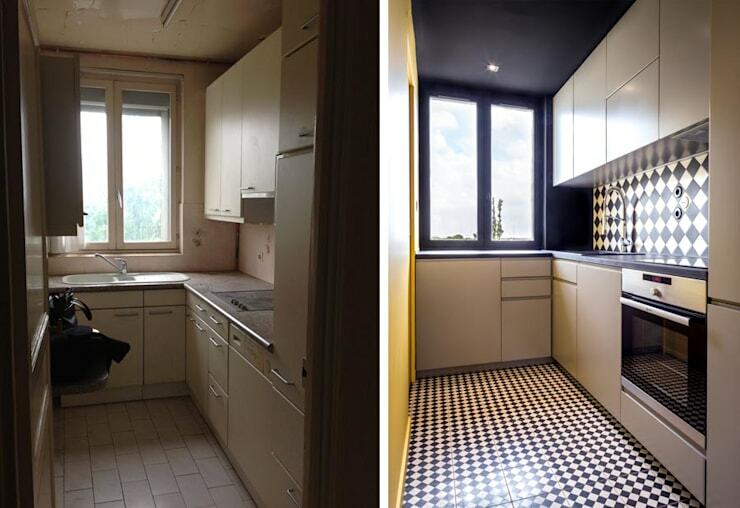 What do you think of this apartment renovation before and after? Comment below!